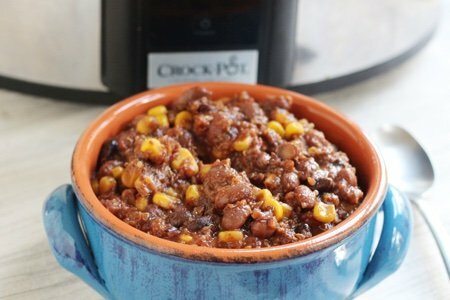 I don’t find many vegetarian chili recipes that I adore. My biggest problem is that they lack the “heft” of meat and the thickness that I am looking for in chili. I like my chili to be hearty (not light). This chili uses quinoa instead of meat and it works for me. I am not a quinoa fan (as I think it tastes like dirt) but in chili I don’t notice the taste and it makes the consistency kind perfect. Hey, I didn’t know a grain could do that! Quinoa can be found in your supermarket next to the rice and other exotic grains (like kamut and bulgur). Some people absolutely love it in a salad with vegetables. This recipe is very inexpensive because you use dried beans instead of canned ones. A bag of beans sets me back about $1. Also, this recipe would serve an army of hungry vegetarians! Please share your favorite uses for quinoa. As a long time vegetarian, I am especially interested in this recipe. Thank you! Quinoa is really our friend. So are you! For someone who can't tolerate spice very much, how spicy do you think this is? Always in my pantry: Seeds of Change: Quinoa & Brown Rice with garlic. Can be used in a million ways or just alone. Delicious, takes 90 seconds in the microwave. I buy it at Costco: they average less than $2 per package and frequently go on sale at Costco with several dollars off the package of six. 250 calories per cup: worth every calorie. I would probably add it to this chili recipe instead of plain quinoa. I should eat quinoa more often! Its in my pantry, but I forget about it and I really like it plus its so nutritious. When I prepare it, it gets rinsed in a mesh colander first, which removes the bitterness. I use it as a starch side-dish dolled up with sauteed mushrooms n onions, or tomatoes n parsley, or whatever veg adds the color to my entree. I like a squiggle of evoo or a pat of butter added too. I'm looking forward to making this, but a quick question for clarification: Is the Quinoa added during the last 30 minutes already cooked or uncooked? Lisa this looks delish...Printed and will give it a try. Easy. Tasty. Healthy. Lots of it. Ditto Barb's comment about the V-8 ad. Why didn't I think of adding quinoa? Thank you! I make this dish a lot, only I don't use a slow cooker. I make it quick and it is very good using my microwave or on the stove. I put all the ingredients in it, but instead I use can beans, rinsed off. And I add can or cooked corn to it, plus the cooked Quinoa last and it's ready to eat in seconds. Yummy!!!!! I actually just cook quinoa in a small (1.5 qt) crockapot...also use it for other grains. Measure out the usual 45 grams (1/4 cup) and put in the greased crock pot with about 3/4 water..I put foil over the crockpot, then the lid and put it on HIGH for 1 hour. Perfect. With quinoa, wash it to get the stuff of it, but other grains, I soak overnight with a bit of acid (apple cider vinegar) to get the chemicals out that will block absorption of nutrients. This stuff is easy to just wash of the quinoa. that should be 1.5 -2.0 qt. crockpot, and 3/4 CUP of water per 45 gms/1/4 c grain. I haven't tried to scale this up, but it would most likely work in a 3 quart for a larger quantity like a 1 cup of grain/cereal. I do this with rice, oatmeal, you name it....! What in this recipe makes it not vegan? I have a vegan friend going through chemo right now and am looking for easy yummy recipes so I can feed her and her family. This sounds great! Can you use canned beans instead of dry? Tammy McCormick: this IS vegan! No dairy, eggs or meat. Also,I just want to add that I don't have a crockpot, tried twice, returned to store...something just seemed not right to me, too boiled flavored maybe vs braised, dunno, but hey, different strokes, right? 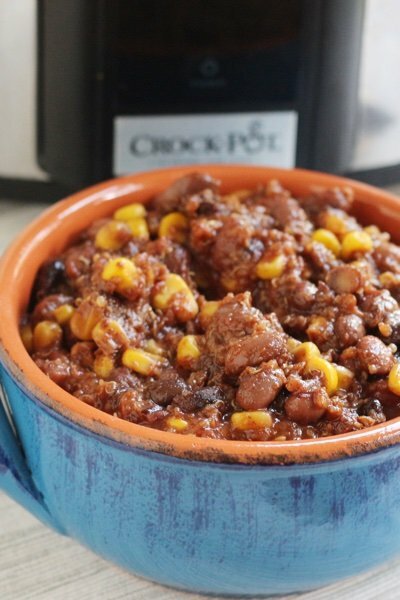 I love chili because its easy and fast and super tasty cooked right on the stovetop! Even with presoaking beans. For the quinoa addition I'm going to precook it then add to my pot o' chili to desired thickness! For a casual gathering around a Fall fire, I'm sure I'm not alone in offering little dishes of toppings like diced onion, sour cream, shredded cheddar, tortilla chips, etc. A little cornbread...what a pretty awesome meal... Hola! pumpkin chili and create a new, united version. I'm with you. I love a hearty Chili! This looks yummy as heck. Hi! Tried this this weekend and had a couple comments -- the ingredients as listed make for a non-spicy chili. I first added a sauteed onion and a few garlic cloves. After the first 5 hours of cooking, I tasted it and it was too bland for my taste. I added double the chili powder, a lot of shakes of garlic salt and a tablespoon of balsamic vinegar. I would suggest cooking the quinoa before adding it. Even after another hour of cooking in the crockpot on high, the quinoa was still uncooked. All in all, I think I would try this again, but I definitely had to do some futzing around with the recipe to make it how I prefer chili. Thanks! @Katie - Thank you for this review. It is not a spicy chili - something I should have made clear in the recipe. I, too, added more chili to make it my level of spicy. I am surprised that the quinoa didn't cook - it worked for me and was done on low in 30 minutes. I am not sure why yours didn't cook. Like Tammy, I initially studied this recipe for the ingredient that made it non-vegan, but I think that Lisa used the word "vegetarian" (instead of "vegan") in the title like many people use the word "vegetarian" -- no meat. Linguistic choices aside, we've got red kidney beans soaking from last night and a half-dozen questionable tomatoes from our garden that I'll be dicing for this, so I can't wait for dinnertime! Thank you, Katie, for the suggestions on boosting the flavor here and, as always, thanks to Lisa for these terrific, healthy ideas! I too would like to know is quinoa cooked or not. Thanks! Made this today. Pretty good. Definitely not spicy at all. Might try adding some cayanne pepper next time and see how I like it. Dressed with some grated jack cheese and sour cream. Will definitely be making again! Oh and my quinoa cooked up just fine, but to be fair I kept my crockpot on warm for 2 hrs after cooking before it was time for dinner, so I'm sure the extra warm time helped.